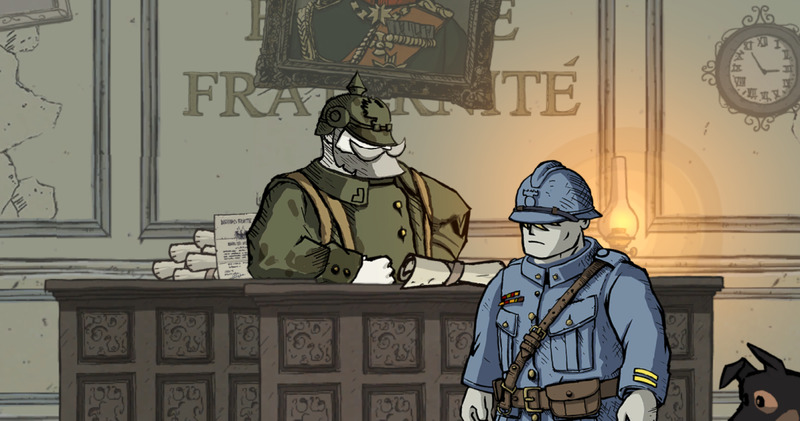 - We're still Karl, this time in the occupied town of Saint Mihiel. At least he made it home... you start off with orders to change; best get to it. Grab the paper from the officer's desk. - Head out of the training center and to the right. A short cut scene follows. Tag the medic as he runs to the right, then follow him to the third floor of the next building. Hand your orders over to the requisitions officer up here to get part of your German army gear. Look beside the changing screen for a German Identification Tag - 1916 Model, as well. - Go downstairs (first floor) once the medic leaves and head right. You can now pass through the rest of the building. Go out the back door in the rear wing, and look to your left to find a pile of apples. Grab one and take it left a ways until you find the medic. Give it to him and he'll hand over a The "Gazette des Ardennes". - Grab a second apple and go back inside. There's a guy behind a desk who's no help at all. Bash the desk to get his attention and bring him over, then, while he's in transit, hurl an apple at the key on the wall behind the desk. Send the dog over to retrieve it before the guy returns to his spot and puts it back on the wall. 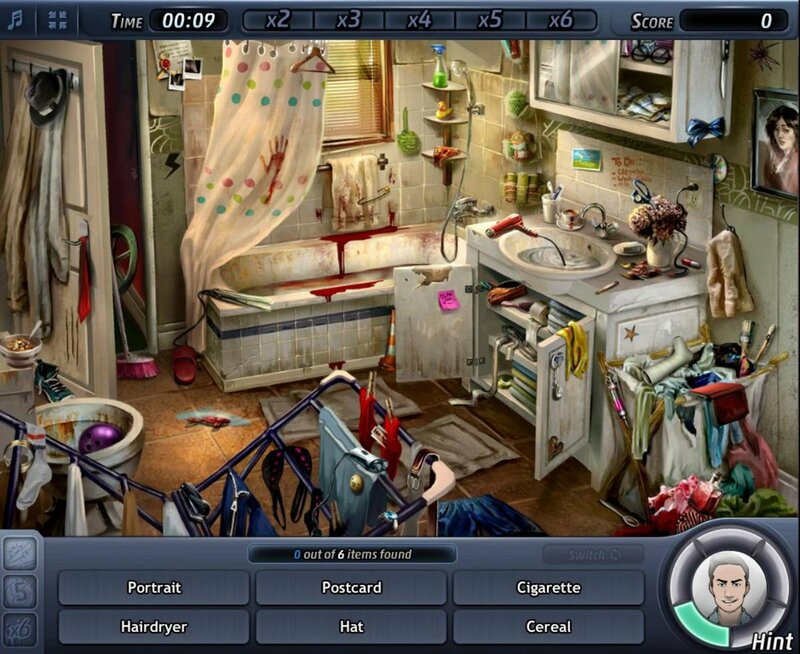 - Take the key to the second floor and use it on the locked door to your right to get into the former commander's room. Grab a helmet from the shelf in the middle of the room, then grab the folded flag sitting on the ground on the right side of the room. 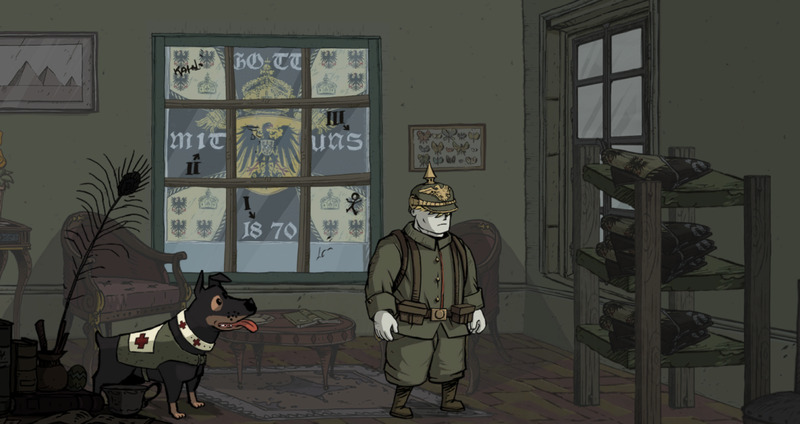 Karl dons a German uniform in Valiant Hearts. - Go back outside through the building's rear exit. There's a flagpole on your right. Use the flag on it, then run it up the pole with the wheel. Once it's up, go upstairs to the commander's office again and look through the right window. The marks on the window show which numbers on the flag form a code - namely, 815. - Take the code out of the office and to the right. There's a locked door here. Use the wheel to input the code. Check the floor in the room beyond for a broken French Bayonet, then grab the pack from against the wall. Karl is now an official German soldier again. - Fully geared and ready, go to leave. Saint Mihiel will come under attack by the French. Leave through the left door (going right will expose you to deadly gas) and make your way across the courtyard. Stay out of the shadows of incoming shells. - Head to the medical truck. Climb in and you'll be whisked to the front lines. - Make your way along the front lines until you reach a gunner. There's a ladder near him. Descend into the earth. - There's a gas mask on your left down here, but it's out of reach. Bash through the debris on the right and go through the tunnel ahead. In the next passage, look to the immediate right of the doorway for a Hip Flask. 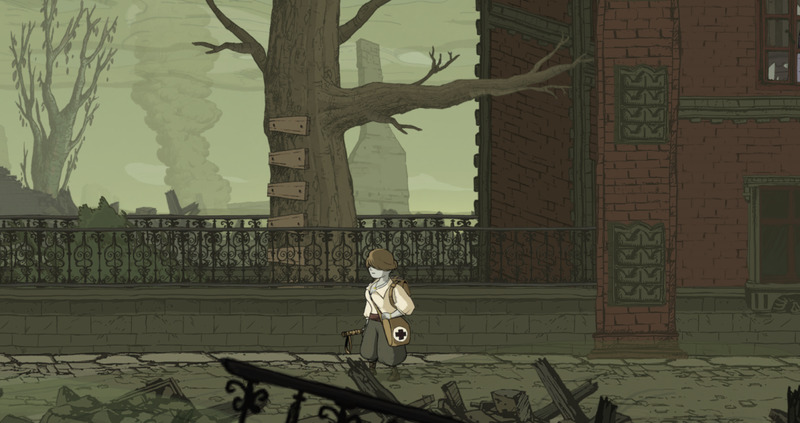 - Up and to the left is a gas mask, and beside it a swaying hook. 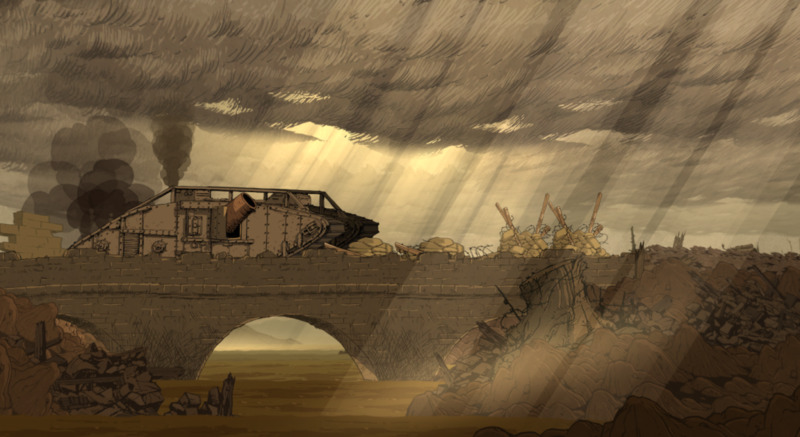 Tell the dog to crawl under the debris to your left and pull on the mine cart there. Doing so will cause the hook out here to rise. Punch the hook enough that it's swinging wildly from one side to the other, then order the dog to pull the mine cart. If the hook is swaying enough it will snag the gas mask and bring it down to you. It goes on the dog. - Return to the previous tunnel and head left. Properly outfitted, the dog can bring back the human-sized gas mask for Karl. Strap it on. - Return to the surface. Check the body of the gunner on your left for a Heavy German Helmet. 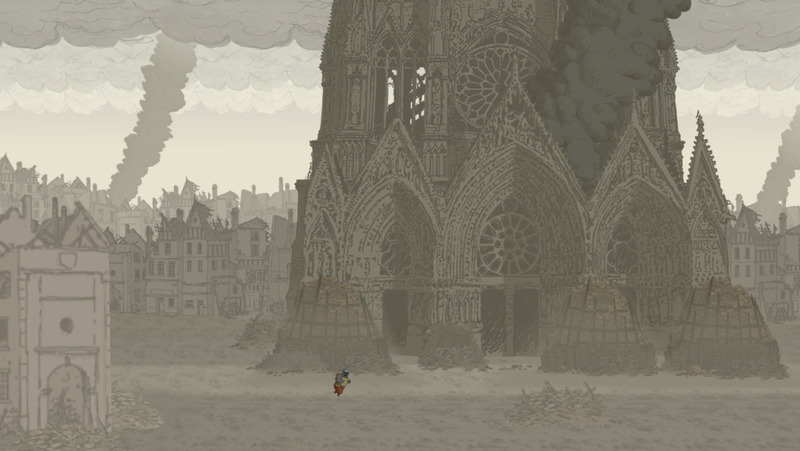 Head back to the right and look for a passage through the gas that will lead you out of this level. 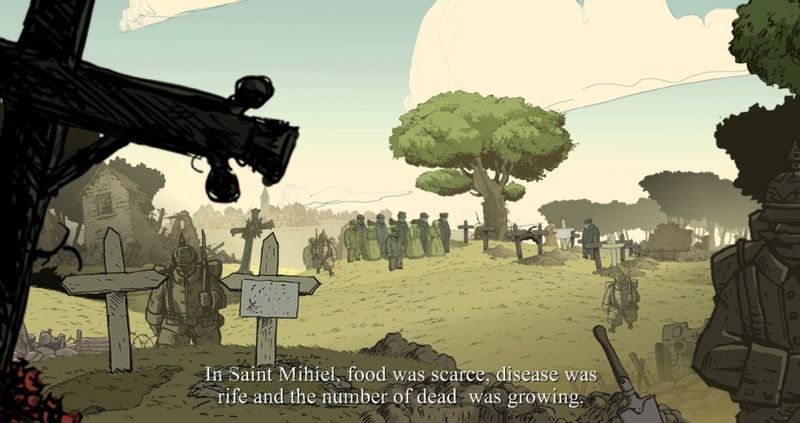 Freddie targets an enemy position from a distance in the Vimy section of Valiant Hearts. - Still going strong. Head right until you find a rocket. Pull on a nearby lever to clear the path ahead. 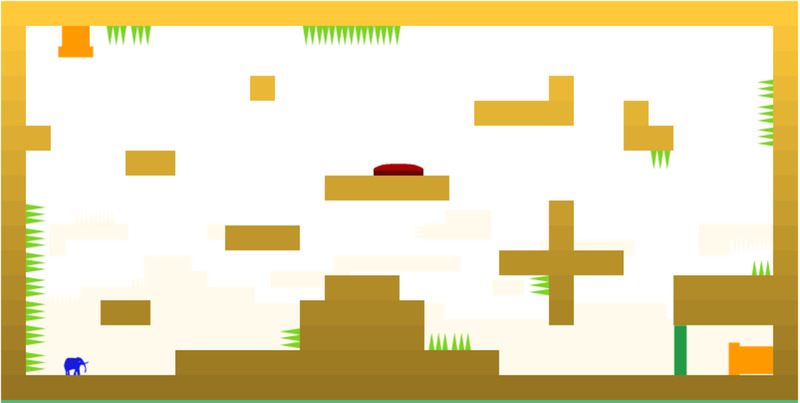 - Run carefully along the trenches, avoiding gunfire from the background. Not too difficult so long as you don't try to power ahead consistently. Hold off on running until the gunfire stops. - Eventually you'll reach a second rocket. This one needs to be aimed properly before you can launch it at the enemy. Leave it for the moment and go through the passage to the right. 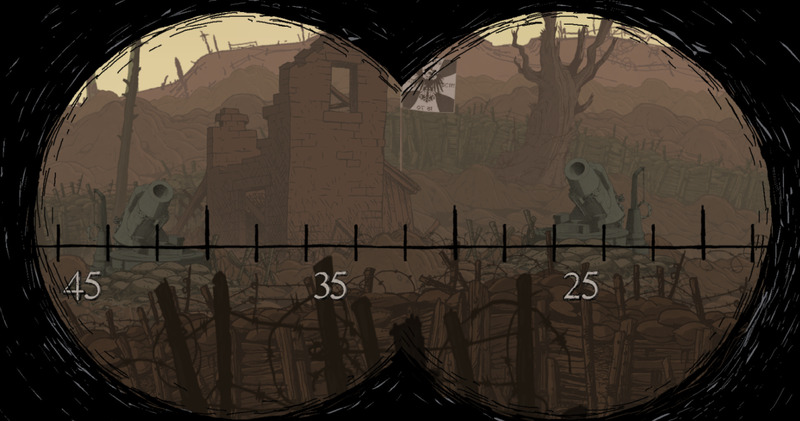 - Check the small bunker to the left in this section for a Brodie Helmet, then use the rangefinder on your right. Use it to determine the angle of launch for the rocket, one that will take out the two artillery guns firing away across the field. The right gun is at roughly 7 degrees; the left gun is at 65 degrees. - Continue right when the shelling abates. You'll come under more enemy fire. Same drill as always, though this time you'll have to bash through debris to let the troops through. Stay in roughly the middle of the screen. - Now you have an artillery gun to aim, but it's missing one of its directional wheels. Climb down the ladder beside the gun, look on the table to the right for Canadian Coins, and head as far left as you can go to find a wrench sitting atop barrels. Bash it down, then use it on the incomplete lever near the network of gears to set the gun to rights. 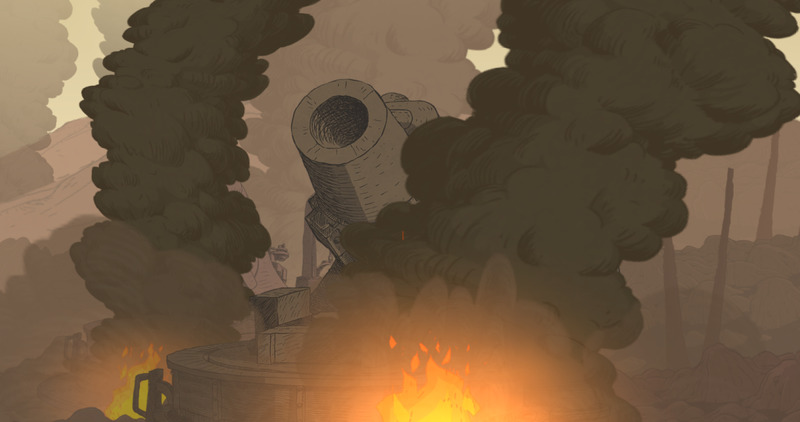 A burning artillery gun in Valiant Hearts. - Head back up top and man the gun. George, your eyes in the skies, will help you aim the gun. Keep firing and following his directions until you nail the enemy gun in the distance. You have as many shots as you need to complete the task. - Another running course follows. The same deal as ever here, but this time you need to keep your eye on the tank in front of you. Halfway through the course it will tip and collapse backward. Keep well behind it lest it smush Freddie. 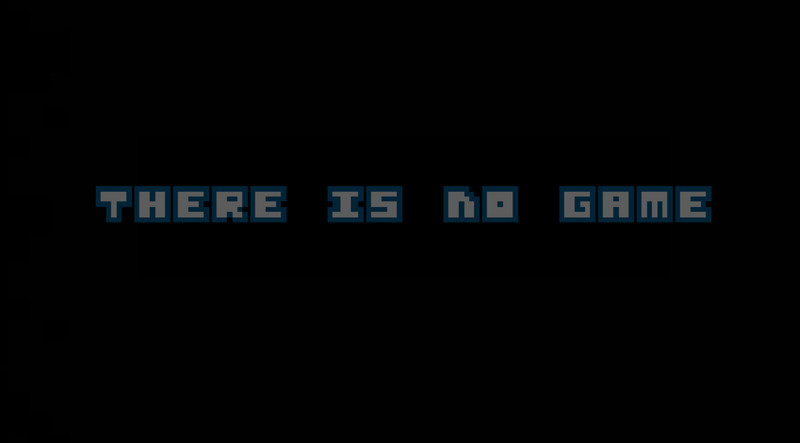 - Soon you'll arrive at a movable cart. Push it right to provide cover, then go down the first passage you reach. Knock out the German guard beside the rocket and fire it off. Do this until you take out the gunner in the nearby bunker. - Join the troops inside. Check beside the map on the second floor for a Crest Model, then go out through the back of the bunker. Help the troops beyond lift the flag in the rear to end the level.